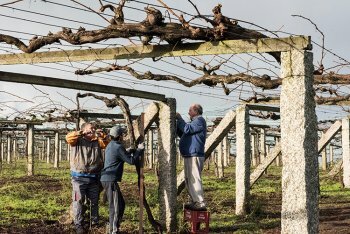 Rias Baixas is certainly well-known for its use of the ‘pergola’ system of vine training. Overhead wires stretched between posts (often hewn from the local granite) looking rather like the staves on a page of music. As the vines grow and are trained along the wires then, inevitably, they are placed under a considerable amount of stress, mostly from the shear weight of the canopy. These days the wires are made from galvanised steel or stainless steel, but even so, they are still prone to ageing and eventually need replacing…. so who you gonna call? The ‘wire man’ (alambrador) of course! The profession of alambrador is highly specialised and therefore the few, skilled artisans still using traditional methods, are always very much in demand. This is compounded by fact that their repair work is nearly always carried out in winter, when the vines are dormant and there is no dense vegetation to contend with. (During the summer months alambradors are usually only called in case of emergency, for example when a wire actually breaks, or perhaps a post is damaged by a tractor – as has happened to us a couple of times over the years). 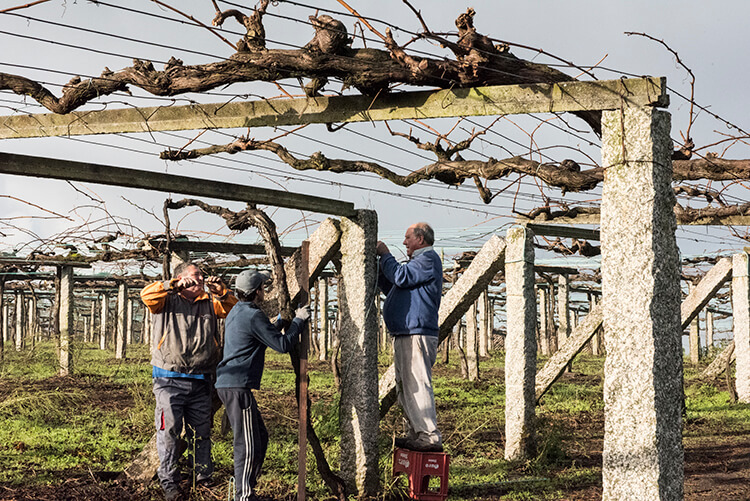 To enable his access to our Cunchidos vineyard, our own guys had to move in swiftly and carry out the pruning and remove the old canopy in record time – we simply couldn’t afford to miss the appointment! Of course the only other handicap that we encounter in winter is the weather. Alambradors can’t really work very effectively in the rain, and so for the last few days they have been working on and off dodging the showers.